New! Read our new guide What is ADSL bonding? If you have exhausted all the tips in our Increase Broadband Speed guide to get the most from your single ADSL connection and you are still waiting for your exchange to be upgraded to superfast fibre broadband, then there is still hope. With ADSL bonding, you can use multiple lines and cost effectively bond them together to increase broadband speeds. This is the first part of our independent review of the Sharedband ADSL bonding services, based upon several days of extensive testing of the service. The innovative Sharedband service allows multiple ADSL connections to be bonded. As these can be from any ISP, the service is essentially available to any broadband user. With Sharedband's Professional package, two lines can be bonded for a total monthly subscription of £20 + VAT. By choosing affordable LLU-based providers, the total monthly subscription for two bonded lines (including voice calls, line rental and Sharedband subscription) can be kept below £75 (inclusive of VAT) - which is substantially lower than Be's bonded ADSL service, which also suffers from limited availability. So far, we have found the service to be excellent and very reliable. Indeed, it has transformed our Internet experience compared with using a single ADSL connection. Download and upload speeds have been very close to the summation of the two individual line throughputs. If you would like to order the Sharedband service, please do so via this Sharedband information and ordering page. This will generate a small commission to help cover the costs of running this site. When attempting to find information on, and providers of, ADSL bonding, we have been struck by the lack of information and widespread confusion about ADSL bonding. ADSL load balancing is not ADSL bonding. Judging by the comments on Internet forums, many people incorrectly believe that load-balancing routers, which can be connected to multiple lines, provide ADSL bonding. Sadly, attempts to view a 3.5 Mbps iPlayer HD video stream by connecting a load-balancing router to two 2 Mbps ADSL connections are doomed to failure. Only true ADSL bonding can properly combine multiple ADSL connections. True ADSL bonding has received little media attention to date, despite its potential to improve speeds for businesses and consumers suffering from poor ADSL speeds. Surprisingly, Be appears to the only LLU operator currently offering and promoting a bonded ADSL service. As well as being relatively expensive, the availability of Be's services is patchy. For example, their services are not available from our rural Cambridgeshire exchange. After nearly giving up hope in the search for a bonded ADSL solution, we came across Sharedband, which may be one of the telecom industry's best kept secrets. We approached Sharedband and Richard Roberts, Sales Director, kindly agreed to let us try their service. Sharedband Limited is a privately-owned company, headquartered in the UK (in Ipswich). It launched its first bonding service in the UK in March 2007, subsequently expanding to the USA in March 2009. The Shareband service aggregates the upstream and downstream capacities of multiple ADSL connections. Dedicated Shareband routers (which are purchased by the user) are used for each connection to be bonded. These collaborate and coordinate the sending and receiving of data packets along each individual connection. All traffic carried along the individual ADSL connections passes through Sharedband’s aggregation server, where it is combined for transmission over the Internet. All traffic that passes through Sharedband’s aggregation server is assigned an IP address, so that it appears to originate from a single consistent IP address. The service is completely automated. Sharedband systems periodically undertake speed tests on each individual line and, based on these results, automatically adjust the amount of traffic sent over each ADSL connection to optimise performance. Sharedband provides several service and equipment options for bonding ADSL lines, the choice of which depends upon budget, the number of lines you wish to bond, the throughput required and whether you prefer an 'all-in-one' modem/router solution or you are happy to use your existing modems. Sharedband offers two main service packages: its Professional package and its Business package. The Sharedband Professional package allows you to bond a maximum of two ADSL lines and has a monthly data transfer limit of 250GB. There is an ongoing monthly subscription charge of £20 + VAT (i.e. £10 + VAT per bonded line). While the Sharedband Professional package may appeal to consumers struggling with their broadband speeds, the more expensive Sharedband Business is clearly targeted at business users. Sharedband Business allows up to four ADSL lines to be bonded, and has an uprated 2000 GB monthly data transfer limit. While the Professional packages include 14-day setup assistance (by email or phone), support is provided on an ongoing basis with Sharedband Business, backed up by a service level agreement. The ongoing monthly subscription for Sharedband Business is £20 + VAT per line. There are currently three Sharedband routers to choose from, two of which are widely available in the consumer market but which have been specifically modified with Sharedband firmware. the maximum combined throughputs that can be achieved. We felt that the documentation on the Sharedband website could have given clearer guidance about router choice, and better explain the differences between the routers and the implications for additional equipment that may be needed. I'm informed that Sharedband is currently redeveloping its website. 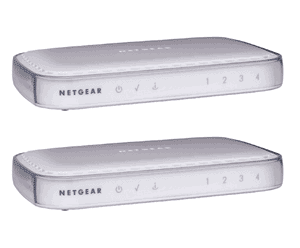 We were initially provided with the Netgear routers for our test. Being the cheapest (and Sharedband's most popular router), they provide an 'all-on-one' solution by incorporating ADSL2+ modems and LAN router capability. The Linksys routers lack onboard ADSL2+ modems, so have to be connected to external modems. Interestingly, while the standard Linksys WRT54GL incorporates WiFi 802.11g capability, this is switched off in the Sharedband firmware to conserve the router's processing power. Read our follow-up review of the Sharedband service with the Linksys routers here. The much more expensive Sharedband Power Routers lack on-board ADSL2+ modems and require an extra router for a LAN, but have the advantage of superior processing, as we will now describe. In the Sharedband service, a router is required for each line to be bonded. 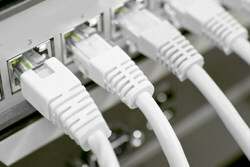 The routers have to be connected to each other using the provided Ethernet cables (either directly to each other or through a basic switch). The Sharedband modems play a vital role in the Sharedband service, and their internal processing capabilities are used to make the Sharedband service work. For example, one of the routers takes charge of bringing together the separate data streams through each connection, which requires a significant amount of processing power. The data processing requirements sets a limit to the maximum total bonded throughput that can be achieved by the Sharedband service, independent of the number of lines to be bonded. With the Netgear DG834v4 and Linksys WRT54GL consumer routers, the maximum throughput is 18 Mbps and 24 Mbps, respectively. The more powerful Sharedband Power routers can achieve a total maximum throughput of 80 Mbps. For broadband users looking to bond relatively slow connections, even with four separate lines, the consumer routers will provide an acceptable solution. The Sharedband Power Routers should be employed when bonding higher speed lines, for example, when bonding two 12 Mbps+ connections or four 6 Mbps+ connections.